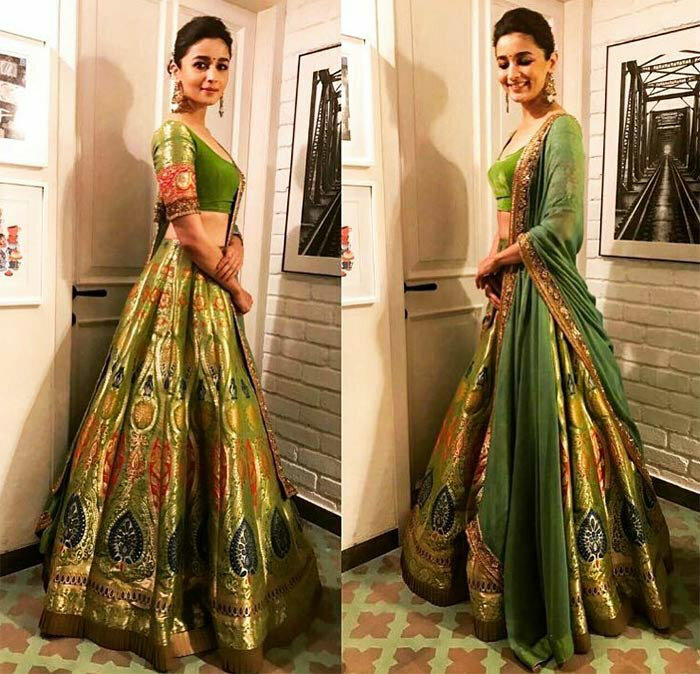 The Diwali party hosted by Bollywood has been a huge gala party event for more than a week before and during Diwali comes around, where we spot all celebs dressed in their Indian Outfits. We love how this year we saw the Lehenga Choli trending the most. 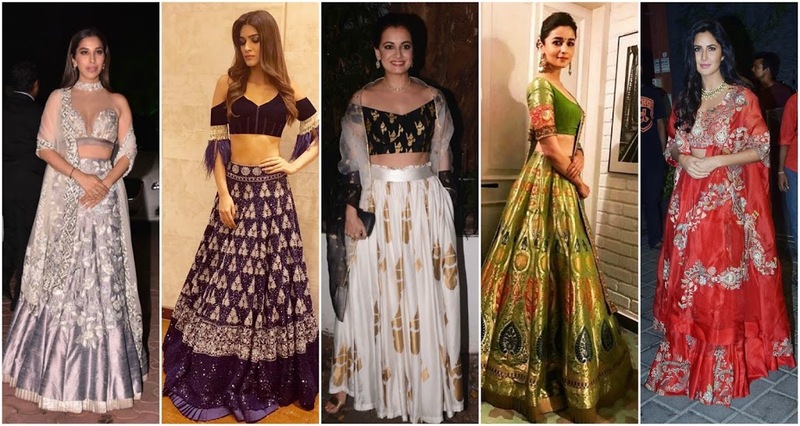 There are so many actresses who carried the lehenga choli outfit for Diwali party 2017, not to mention this year there were so many Bollywood Diwali bashes for celebs to attend at least 4-5 different ones in stylish Traditional, Modern, contemporary Lehenga Choli designs. Here are a few we loved and think is Trendy which could help in choosing wedding lehengas for 2018. 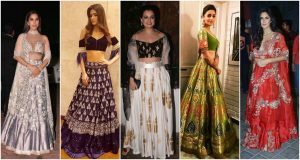 Here’s what the Lehenga Choli the Bollywood Celebrities chose for Diwali Party 2017. 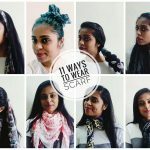 She is on Top of the list as she wore Lehengas 2 times which are both on this list. She carries a stylish Green brocade lehenga and velvet blouse with a green matching plain dupatta to the Diwali Party. Next she also wore a Light Green hue of Lehenga and Kameez style outfit by Sanjay Garg for another Diwali Party. 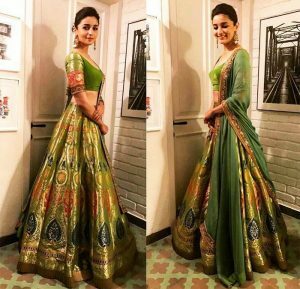 The Goddess of Indian Outfits, loves to choose her outfits to go all stylish and indo western, she chose a Stylish Manish Malhotra Lehenga Choli design at her own Diwali bash. A off shoulder top blouse in fringes stole everyone’s eyes and looked lovely matching the pastel base lehenga with colorful embroidery. This Lady knows her fashion statement just too well, she spotted on a Hot pink Lucknowi chikankari work lehenga choli with a net pink dupatta and embellished halter neck blouse. Kept the look simple but she looked stunning. Love how Chikankari work has brought in a Glam look this season. 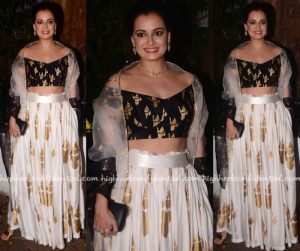 She chose to dress all Quirky but with traditional mixture by choosing Masaba for her couture. A Black and White Lehenga Choli that was perfect Indian Fusion wear for a Diwali Party look. The two lovely sisters and daughters to Sri Devi, Sizzled their evening party look in Glamorous Lehenga Choli looks that we noted be also on the top list. Designer by Manish Malhota, both lehenhas were different, one a fairy-tale theme the other modern glamour. Awe-inspiring choice was made by her for the Diwali party, a bright Pink lehenga choli with just enough statement embellishment to shine her path. Kept her look simple and all she needed was her clutch and dupatta to finish the beautiful lehenga choli look. The lady loves to dress up for special occasions and Diwali is a time she can stun audiences with her Fav Lehenga Choli Picks. She has dressed for more than 3 Diwali Parties this year in Lehengas. These are some outfits we thought looked best of course which is designer by Manish Malhotra. 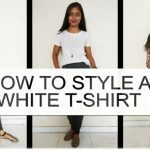 There are so many other actresses from the Bollywood industry and the Television industry who wore Lehenga choli designs, and looked great but here are some which can be chosen as per future trends. We also Saw Katrina Kaif in a Red Lehenga Choli, Bipasha in a Marsala Lehenga and cape shrug look, the Dangal girls in Lehenga Choli, Samita Shetty and many more.